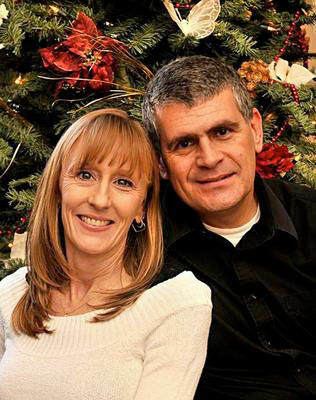 Shane Montgomery (pictured here with his wife, Debi) has been in the ministry since 1990. They were married in August 1980. Pastor Montgomery has always considered his wife the greatest asset to his ministry. They have three grown and married children and ten grandchildren. He graduated from the University of Texas in 1984 with a BS degree in Aerospace Engineering. He worked for Boeing in the Seattle area until 1988. During that time he was called to preach while they were actively serving at Open Door Baptist Church in Lynnwood, Washington under Pastor Ken Blue. Shane studied at the Open Door Baptist Bible College during that time. In 1988, he transferred to Burlington, Vermont as manager of a software engineering department and they became active at Trinity Baptist Church in Williston, Vermont under Pastor David Stertzbach. Shane finished his Masters Degree in Theology in 1991 through Bethany Theological Seminary in Dothan, Alabama. It was in March, 1990, that the Lord called them to New Zealand as missionaries. They began deputation in September, 1990 when Shane left his job. They visited 180 churches in the next 18 months and the Lord provided their needed support and their permanent visa to New Zealand. They served at Rotorua Bible Baptist Church for over twelve years (1993 to 2005), and saw the Lord do great things. They left Rotorua Bible Baptist Church in 2005 to start Casa Grande Baptist Church in Casa Grande Arizona USA. In 2015 Rotorua Bible Baptist Church asked Pastor Montgomery to return and he rejoined as senior pastor Feb 2016. Our Pastor’s vision has always been to see people saved, baptised, taught the Word of God, and trained to serve the Lord Jesus Christ here and around the world.